2. The Eight Core Industries comprise nearly 38 % of the weight of items included in the Index of Industrial Production (IIP). 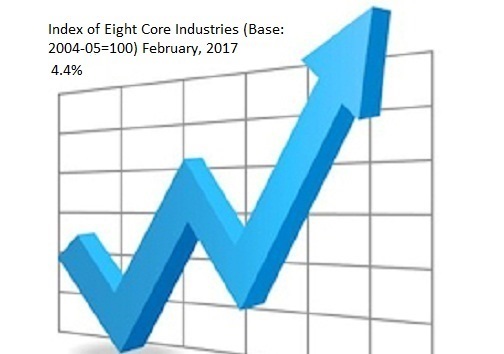 The combined Index of Eight Core Industries stands at 180.1 in February, 2017, which was 1.0 % higher compared to the index of February, 2016. Its cumulative growth during April to February, 2016-17 was 4.4 %. 3. Coal production (weight: 4.38 %) increased by 7.1 % in February, 2017 over February, 2016. Its cumulative index during April to February, 2016-17 increased by 2.8 % over corresponding period of previous year. 4. Crude Oil production (weight: 5.22 %) declined by 3.4 % in February, 2017 over February, 2016. Its cumulative index during April to February, 2016-17 declined by 2.8 % over the corresponding period of previous year. 5. The Natural Gas production (weight: 1.71 %) declined by 1.7 % in February, 2017 over February, 2016. Its cumulative index during April to February, 2016-17 declined by 1.9 % over the corresponding period of previous year. 6. Petroleum Refinery production (weight: 5.94%) declined by 2.3 % in February, 2017 over February, 2016. Its cumulative index during April to February, 2016-17 increased by 5.9 % over the corresponding period of previous year. 7. Fertilizer production (weight: 1.25%) declined by 5.3 % in February, 2017 over February, 2016. Its cumulative index during April to February, 2016-17 increased by 2.1 % over the corresponding period of previous year. 8. Steel production (weight: 6.68%) increased by 8.7 % in February, 2017 over February, 2016. Its cumulative index during April to February, 2016-17 increased by 9.1 % over the corresponding period of previous year. 9. Cement production (weight: 2.41%) declined by 15.8 % in February, 2017 over February, 2016. Its cumulative index during April to February, 2016-17 declined by 0.7 % over the corresponding period of previous year. 10. Electricity generation (weight: 10.32%) increased by 1.5 % in February, 2017 over February, 2016. Its cumulative index during April to February, 2016-17 increased by 5.0 % over the corresponding period of previous year. Note 1: Data are provisional. Revision has been made based on revised data received for corresponding month of previous year in respect of Coal, Crude Oil, Refinery Products, Fertilizer, Steel, Cement and Electricity. Accordingly, indices for the month of February, 2016 have been revised. Note 3: Release of the index for March, 2017 will be on Monday, 1st May, 2017.